As I write this, five jars of red and white wine vinegar and their vinegar mothers sit in jars in the kitchen, working away. I grew all of the vinegar mothers from scratch last summer, experimenting with various mixtures of grape mash, water, sugar, and honey. Last August, I wrote about the confusing and contradictory information on making homemade vinegar. I fretted over whether my batches of vinegar from store-bought mother and from scratch would turn out. Vinegar making seemed like a strange and complicated science experiment. 9 months later, I can say with conviction that vinegar is indeed a wild science-y miracle as, I suppose, are most culinary and propagation endeavors. But making vinegar is also pretty easy, requires little time on the human’s part, and produces fabulously tasty results. 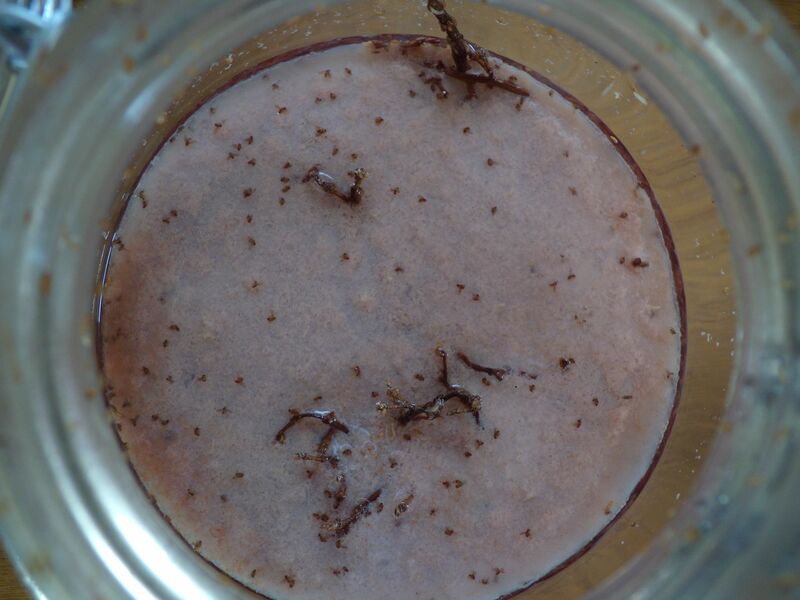 Fruit flies rock. I initially read conflicting opinions on the importance of allowing fruit flies to colonize the vinegar concoction when one is trying to raise a vinegar mother from scratch. Short answer: almost all of my jars of fruit, water, and sweetener quickly grew beautiful vinegar mothers in the presence of swarms of disgusting little fruit flies. 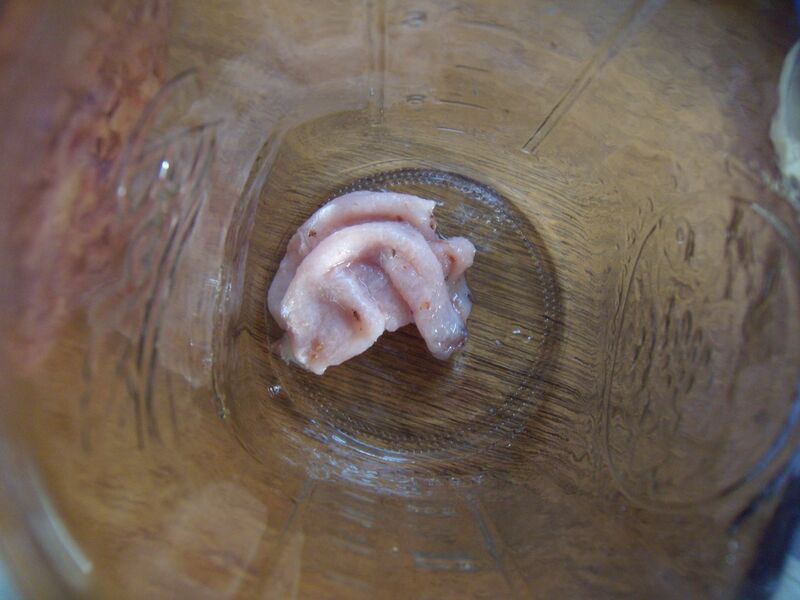 The flies’ magic comes from the vinegar-making bacteria on their feet. Once you have a vinegar mother established, there’s no need to include fruit flies in the jar for future batches of vinegar. Neglect your vinegar mothers too long, and they will mold. 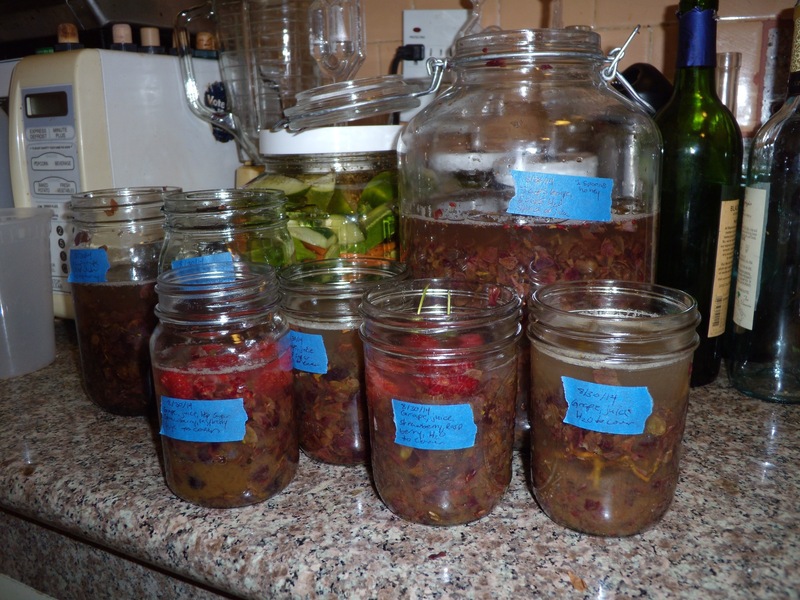 After bottling finished vinegar in December and feeding the mothers their wine/water mixture, I got busy and didn’t tend to the jars until mid-April. While the majority were still doing fine, some of the smaller jars of white wine vinegar had grown flamboyantly colorful mold patches and had to be thrown out. One of my biggest points of confusion when I started this project was how long it takes for the mother to turn the wine into vinegar. 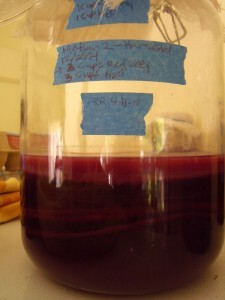 I now know that it takes about a month for a new layer of mother to form on top of the wine, indicating that the vinegar is ready for consumption. Timing definitely depends on the size of the mother in relation to the amount of liquid you add. It will take a small mother longer to digest the alcohol in a comparatively large amount of wine. However, once your mother has finished her first batch of wine in a given jar, she should be able to complete the next batch in the same sized jar in about a month. Darkness isn’t required for vinegar mothers to do their thing. As with most of my projects, I’ve become lazier and relaxed my standards over time. In the beginning, I thought vinegar mothers needed total darkness to be happy. These days, my ladies live in glass jars on top of the refrigerator (for warmth), and I’ve scrapped trying to swaddle them in towels to keep them in the dark. They’re growing just fine. My happiest (and only remaining) white wine mother. I keep my ‘vinegar records’ written on painter’s tape on the sides of the jars. I love the layers of mother that build up in the jar over time. If I were in the business of maximizing my vinegar production, I would be diligently dividing these pieces of mother to start new production jars. The white wine mothers produced the most interesting mold colors. A few of the reds molded too after months of neglect on my part. Over a year ago, I stumbled across my first Little Free Library. It was just a glass-fronted box with a roof in somebody’s front yard, and it was full of books. A sign on the side read, “Take a book, return a book.” I thought it was just one person’s cool idea. Little did I know it’s a worldwide project. As soon as I searched the Internet, found the website, and saw the world map dotted with locations of tiny libraries, I wanted one to nestle into our (future) front yard garden. I love books, and I love the idea of people in our neighborhood stopping in front of our house to pick a book out of the library, and perhaps return one of their own. More recently, I’ve been toying with the idea of adding a curbside seed exchange to this vision. Kelly and I are committing ourselves this year to growing only open pollinated seeds and saving them in a more organized and intentional manner for future planting. Why not invite our neighbors to share our seeds and offer their own? Combining a library and seed exchange seems, somehow, very appropriate. It was only this week that I made a trip to the thrift store with my dad, not really expecting to find the perfect library/seed exchange vessel, but hoping. And there it was: $5 and covered in dirt (I hope it was dirt, anyway!). The cabinet is a little bigger than I’d imagined, and I wobbled home with it protruding from my hatchback. Fortunately, some neighbors took pity on me and helped carry it to the garage. This is going to be a library in my front yard, I told them. You should come back and check it out. I’m not totally sure they got it, but they smiled at me before retreating across the street. 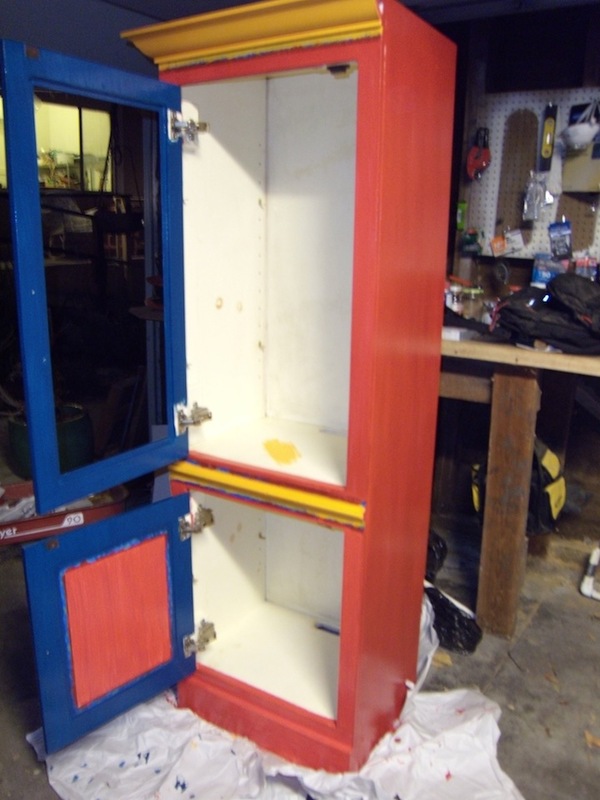 Now for layers and layers of bright paint. I am trying to be patient, as I wait for paint to dry and ruefully inspect yet more accidental drips that will require yet more layers of paint. Egad. Picture me at 10:00pm in clogs and Carhartts painting by the light of Kelly’s headlamp and the dim overhead garage bulb, and fretting over whether ‘Candy Apple Red’ and ‘Tropical Sky’ really go with ‘Mango Madness’. That’s how crazy and excited I am. When the new little garden library is ready for its debut, Kelly insists we should distribute announcement flyers to neighbors and invite them to a grand opening reception. I feel slightly foolish, but I do secretly hope that at least some of them will be as delighted as we are by this addition to the neighborhood. 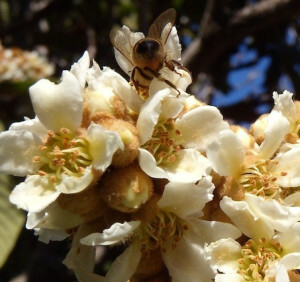 Honey bees love loquat blossom nectar as a winter food source. Our loquat harvest was incredibly small last summer, and something special seemed to be required. Rather than make loquat jam with so little fruit, I made liqueur this year, using the entire harvest – 4 1/3 pounds of fruit. Liqueur making takes patience and it felt a long way from summer when I finally bottled the loquat liqueur this chilly morning. Small though my sips were, I can say it’s one of my favorite liqueurs that we’ve made so far. The flavor is subtle, but sweet and well-rounded. I’ve started using shochu, or Japanese vodka, for most of my liqueurs. It doesn’t have the alcoholic punch of vodka (it’s 48 proof, compared to 80 proof vodka), and its very slight sweetness makes it compatible with most fruit. Read on for my original recipe and notes. 1. Put fruit, sugar and coriander sprigs in jar and add shochu. Shake until sugar is dissolved. 2. Store in a cool, dark place, and continue to shake occasionally over 6 months. 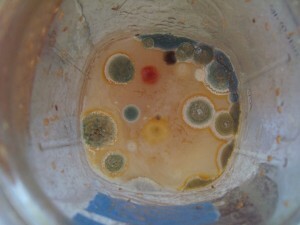 Discoloration of the fruit is normal, but watch for mold (I didn’t have any problem). 3. 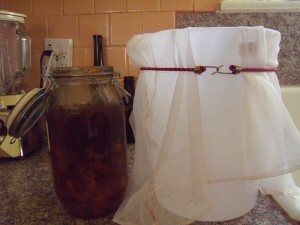 After 6 months, secure cheesecloth to a container, and strain liqueur through cheesecloth. Allow fruit solids to sit in cheesecloth overnight. 4. 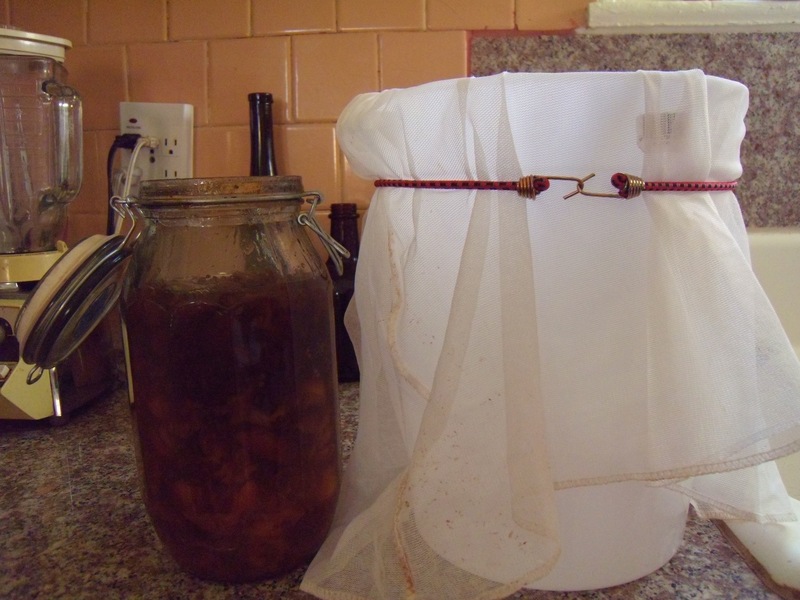 In morning, remove cheesecloth and gently squeeze into the container. 1. In my original recipe, I used a medium handful of green coriander sprigs (cilantro plants gone to seed, before seed dries). I’ve increased the measurement here because I can’t really taste the coriander in the liqueur, and I’d like to. Next year, I’ll increase the amount of coriander. You can leave out the coriander, or substitute a different spice or herb. 2. I actually used one bottle of shochu plus about 1/8 of another bottle, which was leftover from some other liqueur project. 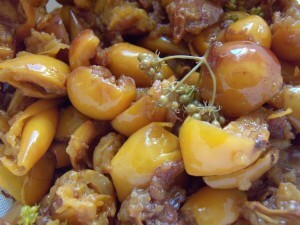 Obviously, you can adjust the quantity of shochu and sugar, depending on how much loquat fruit you have on hand. When I first started making liqueurs, I aimed for a 2:1 ratio of fruit to sugar (by weight). I’ve since been experimenting with less sugar, and with honey also. I then add alcohol to fill whatever jar I am using. 3. Be sure the lid to the jar has a good seal. If it doesn’t, add plastic wrap on the inside of the band before closing. 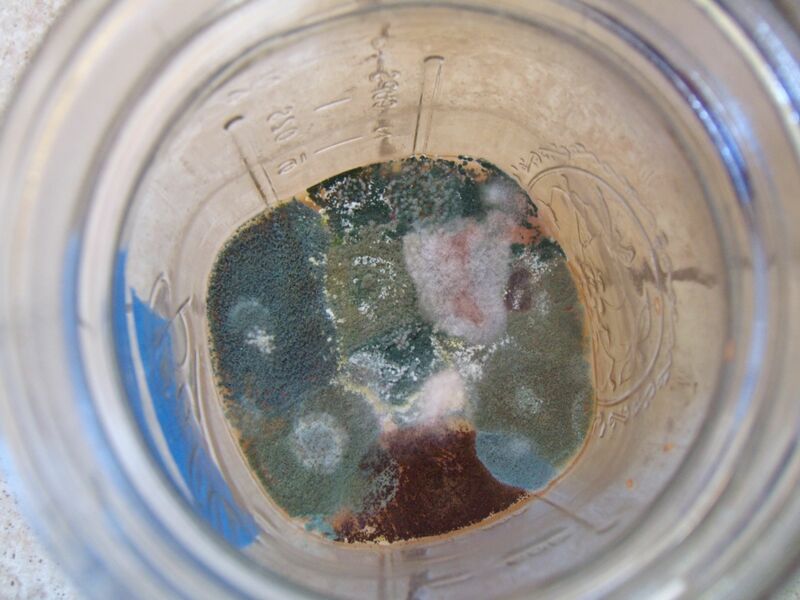 This helps prevent mold, though it isn’t common for mold to form in the presence of alcohol. 4. 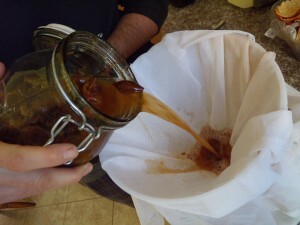 You can use cheesecloth or any similar type of cloth or bag to strain the finished liqueur. The tighter the weave, the better: this helps strain out the sediment. 5. I let my liqueurs steep for six months. When I made my very first plum liqueur, the recipe called for six months. The results were awesome. I’ve followed this timeframe ever since. You might be able to subtract some of this time for other fruits, but I wouldn’t with loquats. 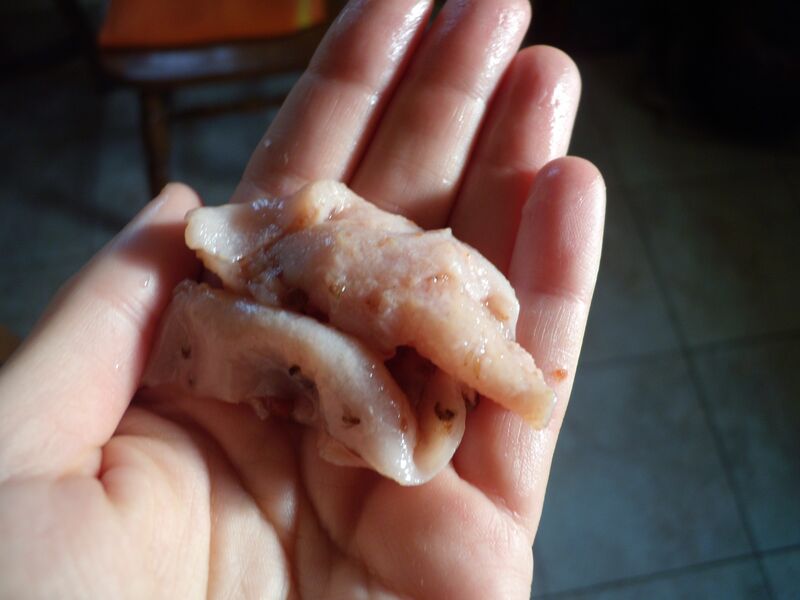 They have a very subtle flavor, and the timing allows for maximum flavor extraction. Loquats and coriander after six months in shochu. We usually discard the fruit after straining. We make lots of other yummy home alcohols, and you can too! For instructions on how to make plum wine, check out our post, Homemade Plum Wine Results; for additional tips and tricks (this year’s batch is based on that first recipe, but is turning out much tastier!) check out Homemade Plum Wine, 2013; to learn about the hands-down yummiest plum liqueur on the face of the earth, take a look at Not-Traditional Umeshu. We like the idea of installing a gray water system, but we have lacked the plumbing smarts, financial resources, and home ownership (we have to run everything by the landlord) to make it a reality. Now, however, due to a sewer backup, we are on our way to gray water bliss. A few weeks ago, while running a load of laundry in our hand-me-down water-inefficient washer, the toilets began making ominous gurgling noises, and sewage backed up into the shower. After calls to a plumber and the city, we thought the problem was fixed. Last weekend, another load of laundry started the toilets gurgling and sucking all over again. Rather than tempt fate, Kelly stopped the load. But we really needed to finish the wash. And it was then, in a characteristic streak of brilliance, that Kelly landed on a solution that achieved both peaceful sewers and nearly 200 gallons of salvaged gray water (so far!). I have to stop here and assure you that, as brilliant as she is, Kelly is no plumber. Neither does she have any special engineering or âhandy-manâ training. This is really really simple, and if youâre in our positionâhankering for gray water, while balking at the expense, trouble, etc.âyou should give it a try! MaterialsÂ (highly variable and flexible depending on your needs and what you have laying around): Length of four-inch PVC pipe, two flexible rain gutter extenders, two 96-gallon plastic garbage containers (with lids), one five-gallon bucket, bricks/cement blocks/wood as needed. 1. Remove the âdrain hoseâ (i.e. 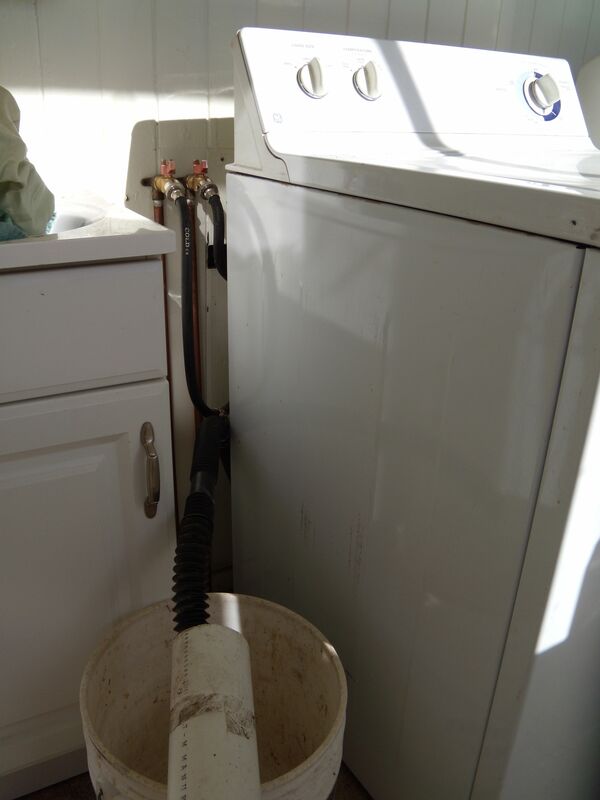 the rubber hose that comes from the back of your washer) from where it disappears into a hole in your wall. The black drain hose can be seen here extending over the rim of the bucket and inserting into the white PVC pipe. 2. Insert the drain hose into a length of pipe (ideally, a non-flexible pipe long enough to make it outside without further connections). We used a length of four-inch PVC pipe that measured about 7-8 feet long. 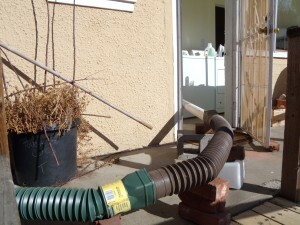 We positioned a five-gallon bucket under the âconnectionâ between the pipes (drain hose jammed into PVC). This way, any leaks would go into the bucket rather than onto the floor (there were no leaks!!!). 3. 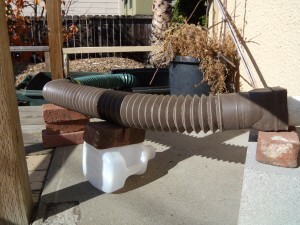 We attached two flexible rain gutter extenders to each other and connected them to the end of the PVC pipe to add necessary length and make some turns. 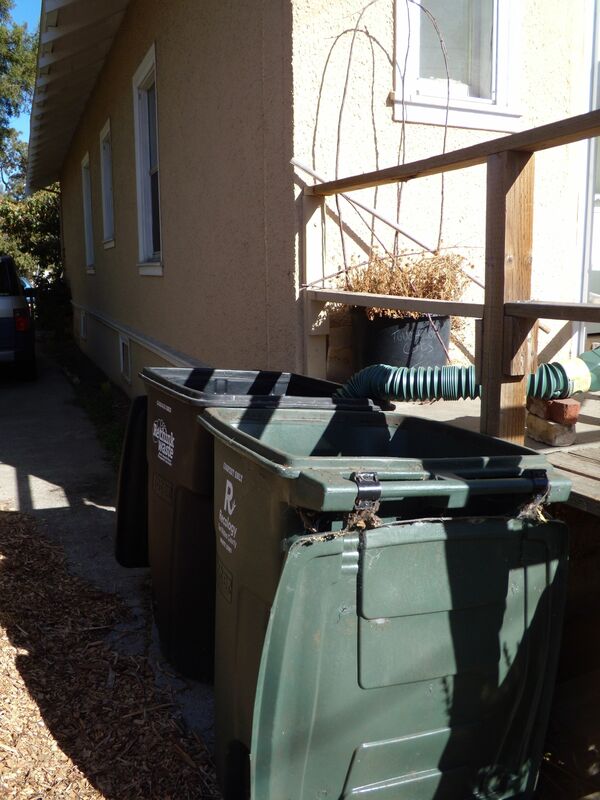 We fed the end of the last flexible rain gutter extender into an empty garbage container. The PVC pipe is on the far right-hand side of the picture. From there, the flexible rain gutter extenders complete the distance to the just-visible water receptacle off the edge of the porch. We may have an advantage in this regard, as our house is high off the ground. 4. We arranged stacks of cement blocks and bricks under different portions of the piping to ensure that all of the piping went downhill from the washer to the garbage container turned gray water receptacle. 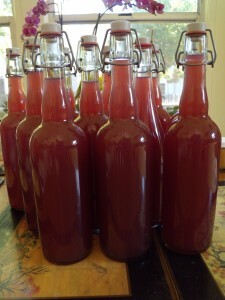 We finally bottled my plum wine a few weekends ago, and for a first batch, it was actually drinkable. Strong as hell, not the tastiest, full of room for improvement, but drinkable. I did two fermentations. Twenty-four hours after the campden tablets dissolved, I made a sugar solution in a quart jar with 2.25 pounds of sugar, 16 ounces warm water, and plum juice and stirred it into the juice in the bucket. I then made a yeast solution (with champagne yeast, recommended for fruit wines) and added that. 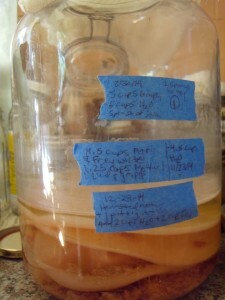 When the yeast activity slowed, about 12 days later, I transferred the liquid to a carboy, and did another fermentation with the same recipe of sugar solution. This means I added 4.5 pounds of sugar to 4 gallons of straight plum juice. 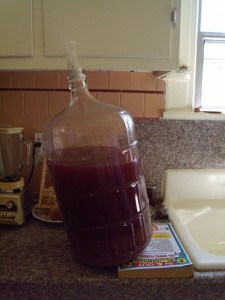 The wine then sat for about 4 months in the carboy. When I siphoned the stuff into the bucket for step one of the bottling process, just having it in my mouth gave me a gentle buzz. When I had a less-than-8 oz glass with dinner that night, the buzz did not seem alcoholic as much as it seemed other-drug-like. Relaxing and pleasant, nonetheless. Sarah and I both have a sweet tooth, and this wine is sour. It has a nice fragrance and does not smell vinegary, but it is sour. We experimented by adding sugar to the desired sweetness. This made the wine more palatable, but if it weren’t homemade, I can’t honestly say I’d be drinking it. I sent a bottle off to Richard, my plum wine-making mentor, who prefaced his responding email, ‘DO NOT DUMP THIS WINE!’ He’s very positive. He thought the wine was too acidic, but has good color and is decent for a first attempt. 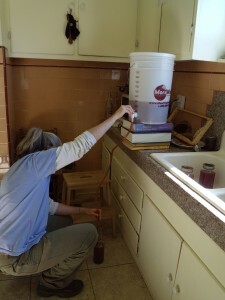 In the meantime, after we bottled it, I discovered all kinds of online literature that pointed to sweetening wine before bottling it, but cautioned that the yeast may undergo another round of activity. A home-brewing friend said champagne yeast is rather notorious for behaving this way and suggested sweetening after opening the bottle. 1. I don’t even really like champagne or other dry wines. And the back-taste of champagne is quite present. I think I’ll research other suitable yeasts. 2. The plums weren’t necessarily ripe. The tree had been stripped clean, plum ready or not. I think I’ll opt for ripe fruit next time, or a bit overripe, or some combo. 3. Yes, I will add more sugar. 4. But I think I’ll taste-test more along the way, too. Doh! 5. 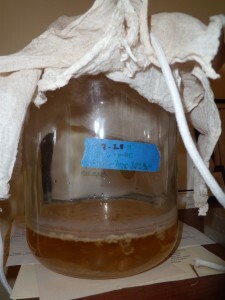 Did I let the wine sit in its yeast debris too long? Maybe I should have siphoned it off, then let it sit. I remember Richard saying he strained before letting it sit for a few months. It is. It has a great color and clarified nicely (an attribute of champagne yeast apparently). It isn’t horrible, it’s just not as good as it could be. I think I have 10 bottles. I used it to cook a pork roast one night. The more applications, the better, I think. Pre-siphoning. The wine clarified nicely. Bottling the wine after siphoning and filtering. We made improvements in our 2013 plum wine! 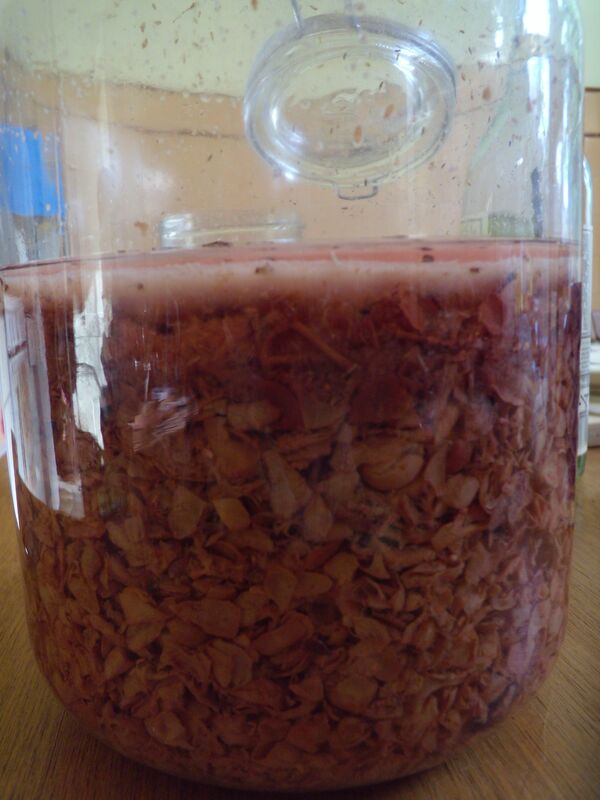 Check out Homemade Plum Wine, 2013 for details. 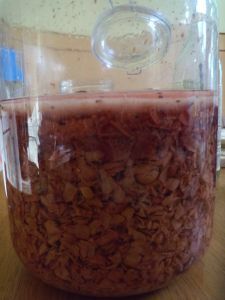 If you want to try making the best plum liqueur we’ve ever tasted, read up on Not-Traditional Umeshu.